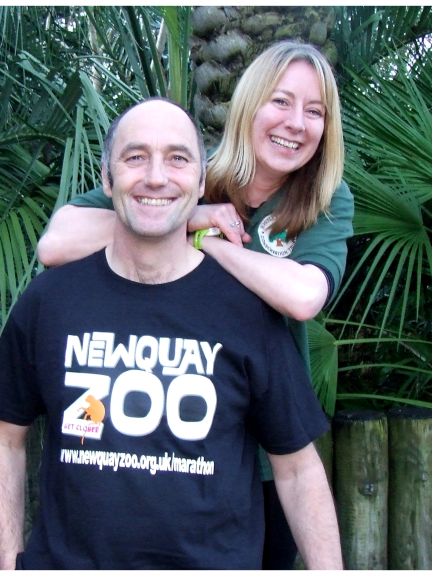 Two members of staff are running the famous race in April: Newquay Zoo Curator of Animals John Meek (on behalf of Newquay Zoo) and Paignton Zoo Visitor Services Manager Izzy Warren (on behalf of the Whitley Wildlife Conservation Trust, both zoos’ parent charity). Izzy Warren runs through constant pain but is determined to complete the iconic run. Strongly dyslexic and with a smile that can fill a room, she was born in London and has lived in Worcester and Coventry before settling in South Devon. She’s assembled an extreme CV: she’s abseiled down a church tower, cycled from Lands’ End to John O’Groats, completed the Three Peaks Challenge (taking in the highest points of England, Wales and Scotland) and jumped out of a plane at 1600 feet, all to raise money for the charity that employs her. “The greatest gift I have ever received is a signed copy of Sebastian Coe’s book saying good luck and dated 2012 , my wife knows his wife!” He enjoys athletics and football and completed one parachute jump – “Never again!” - but he has always wanted to run a marathon. And the rivalry? It’s not about who gets to the finish line first, for both of them it’s more about testing yourself, getting there and raising some money for charity. and www.virginmoneygiving.com/JohnMeek1 . You can also donate at front of house at Paignton Zoo or at reception at Newquay Zoo. All money raised will support the conservation work at the two zoos.